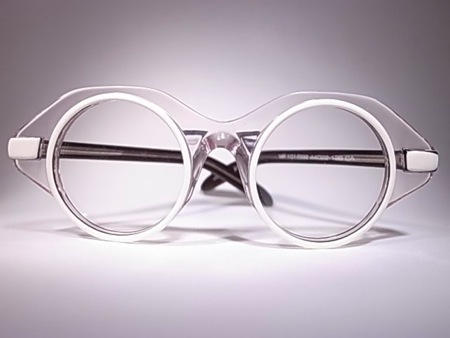 We don’t know a lot about German eyewear label, Neostyle but we do know that they have some wild vintage frames worth mentioning here on Frame Geek. These today are some of the most unique designs we’ve seen in a relatively wearable mold. Called the 101/598 these all clear, all acetate rounds immediately create a story around the wearer. In an almost swimming goggle style, the 101/598s have an exaggeratedly thick upper rim and sides which wrap into to wearer’s face. Stark white arms complete the colourway, giving it an exciting but continuous finish. Dead stock eyewear from Germany. We love it. Get them online through M Vintage. This entry was posted in Uncategorized and tagged Frame Geek, Germany, VIP. Bookmark the permalink.